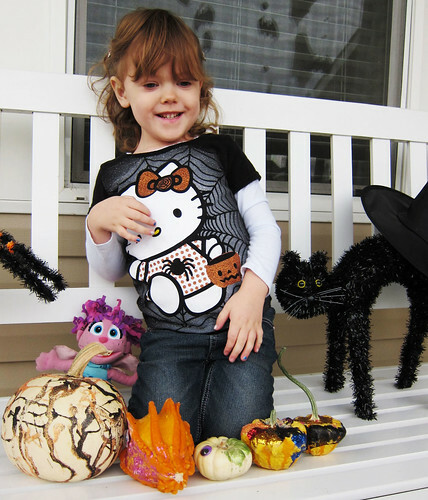 For months well since last Halloween really Lily kept telling us she wanted to be a cat for this Halloween. This wasn’t surprising since she’s a cat most of the time and then a few months ago she changed her mind and all of the sudden she wanted to be a piggie. I asked her if she was sure and she swore she was. I came up with a plan for this piggie costume. I would buy her some pink and white striped leggings or tights and a pink shirt. I would make her a pink tutu and a set of piggie ears and tail. I found tutorials on Pinterest for the tutu. I bought 4 spools of pink and silver tulle and started making the tutu. It was adorable. Then Lily started telling me she wanted to be a lamb, I said fine, but it has to be a lamb with a pink tutu. Then she wanted to be a frog, fine as long as it’s a frog with a pink tutu. This went on for a few weeks. She came up with different animals and I said fine as long as you wear the tutu, over and over again. 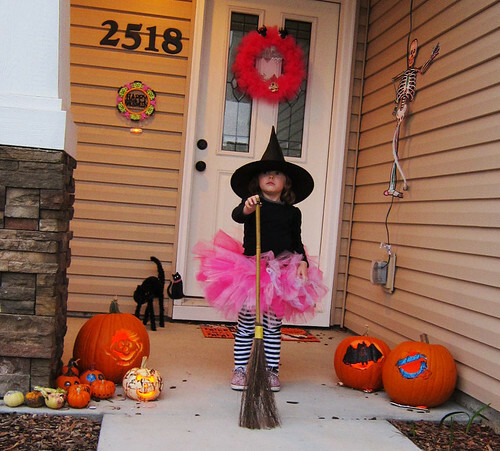 Then she settled on a witch and she was very serious about being a witch. 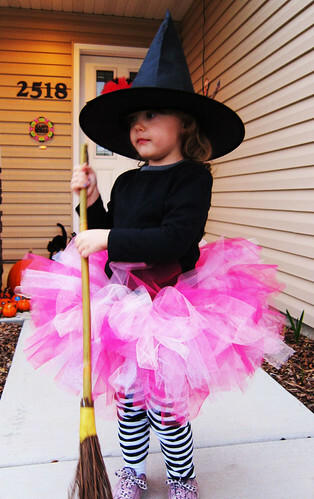 I said fine as long as you wear the dang tutu. She was fine with it so we went on with our planning. Waldo and I decided to decorate the front porch for the first time ever. Once this was decided I went crazy with planning. We picked up a few things here and there. 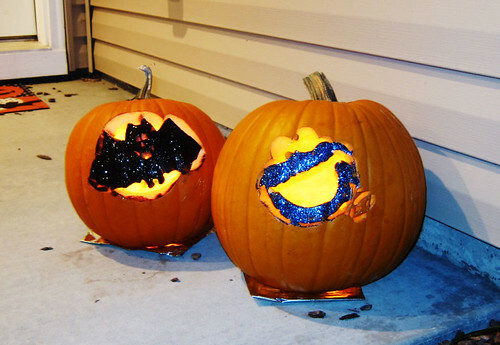 I ended up buying a large number of pumpkins and glitter. I hadn’t planned on using them together but it worked out that way and it started a pattern. This year ended up being the year of glitter. 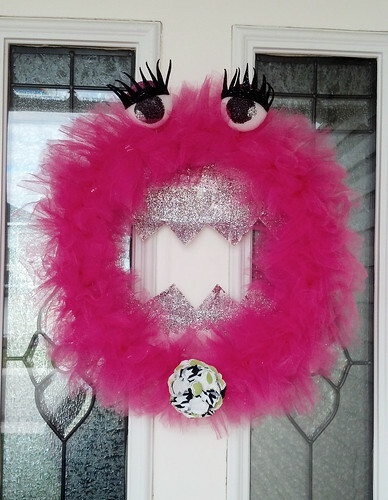 I also found a wreath tutorial on Pinterest that I was really excited about and all in all I am so happy with how everything turned out. Lily and I went to Hobby Lobby to get the green tulle and while we were there I noticed pink tulle right next to the green so I asked Lily her opinion and not surprising she choose the pink. Once she decided pink I went all out girly with it. I added eye shadow and glittered eye lashes. Instead of a bowtie I went with a flowery thing. And I glittered the heck out of her teeth. I loved her. I found this little wooden halloween sign at Michael’s and tried to get Lily to paint/color it and she had no interest so one night on a whim I glittered it. 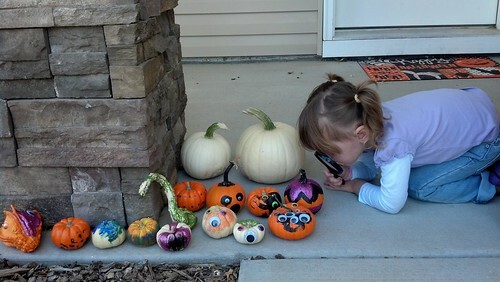 Lily and I painted/glitter glued/glittered all of our pumpkins and gourdes except the three that we planned to carve. I made 4 little ghosts and hung them outside. And the next day it rained like I’ve never seen it rain here before (probably I don’t pay a lot of attention unless we are going out) and I was shocked that only one ghost came off. 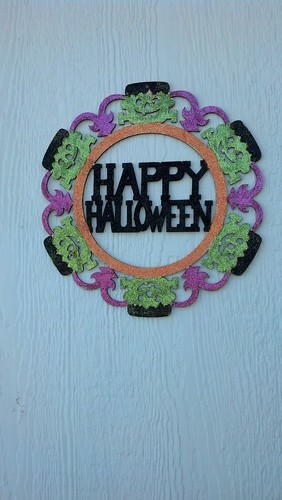 What I was super unhappy about was all of the glitter that came off of the halloween sign and pumpkins. I guess using watered down school glue wasn’t the best idea for outdoor decorations. 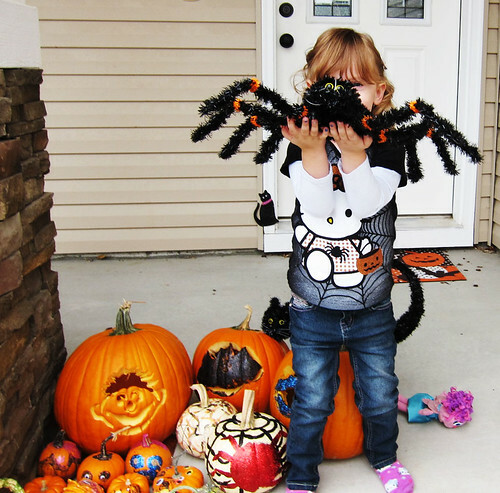 Luckily my spider pumpkin wasn’t outside yet, I would have screamed, I worked hard on that baby. 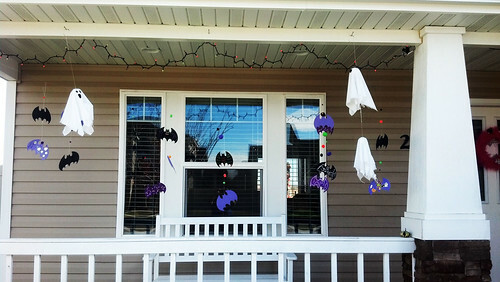 After the rain stopped Lily and I decorated a bunch of craft foam bats and I strung them on the porch. Then the wind picked up and I spent the rest of the week until Halloween trying to untangle them. I really liked the outcome, but it totally was a lesson learned. I have different plans for Christmas decorating. Oh and Waldo and I strung some Halloween lights on the porch too. 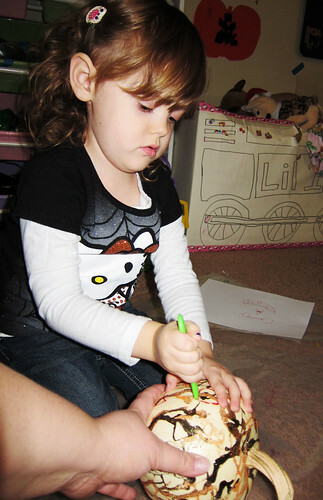 The weekend before Halloween we rolled up our sleeved and dug out some pumpkin guts. Lily hated that part. 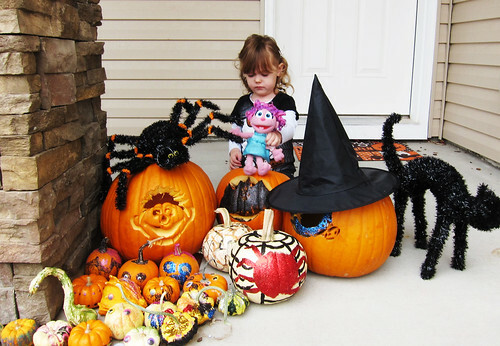 She stuck her hand in the first one and that was that, she wouldn’t put her hand inside a pumpkin again. 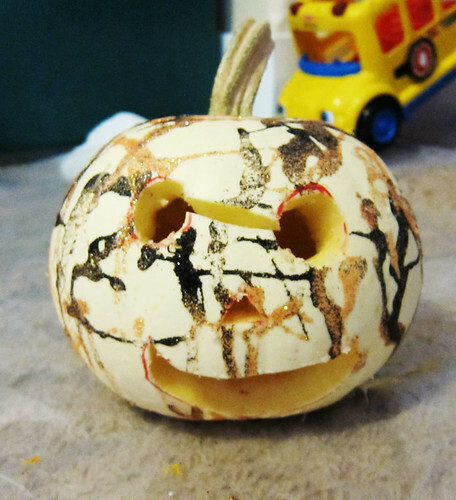 I guess I didn’t upload any of the carving pictures. 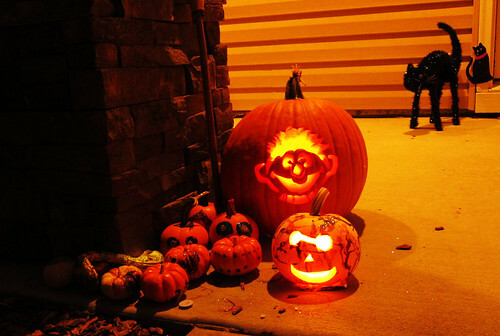 I carved Cookie Monster and Ernie, Waldo carved a bat and was planning on putting Bert on the Ernie pumpkin, but he’s been working lots of OT and ran out of time. 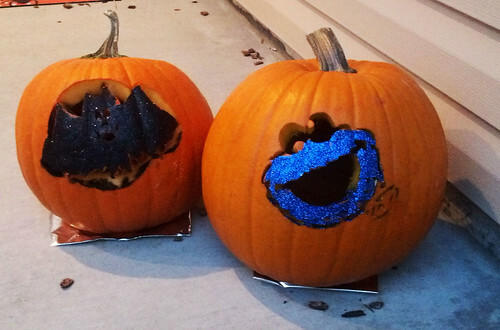 After we were done carving I was admiring my Cookie Monster and decided that he needed a little something extra. So I glittered it and Waldo’s bat. Ernie was spared. On Halloween day Waldo and I realized that Lily could carve a pumpkin with the little special knives so Lil and I sat down to get to work. She mostly designed it and we shared cutting duties. Lil decided that he needed to be wearing glasses so the line between the eyes is for his glasses. 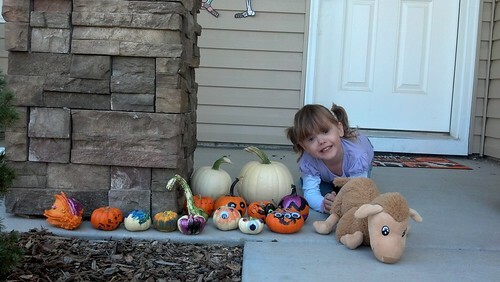 On Halloween day I like to take an obnoxious amount of pictures with Lily and our pumpkins. 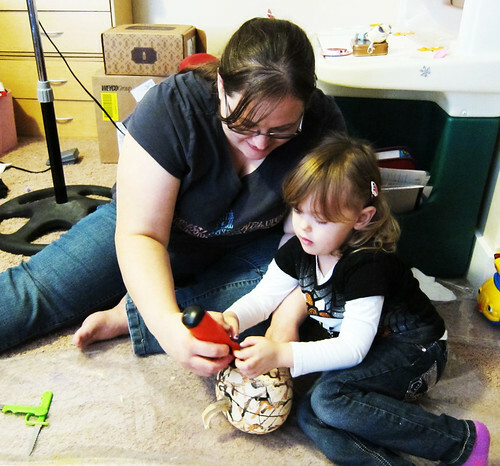 I did it last year and we love seeing the pictures come up on my rotating desktop. 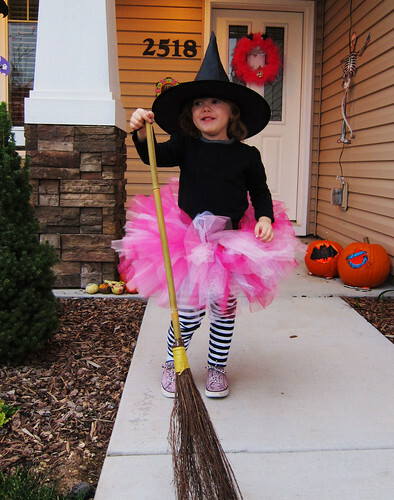 When I was planning Lil’s witch costume I had planned on buying a black shirt and putting silver sparkles on it. 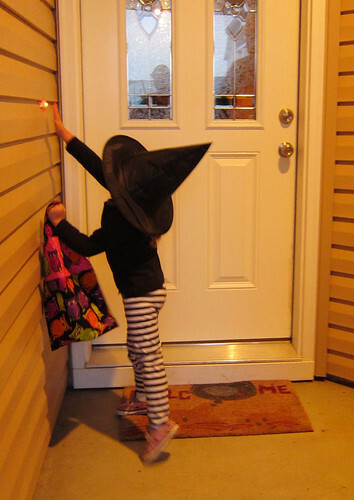 I was also going to spark up the black hat and broom. When I told Lily about this she put her foot down. 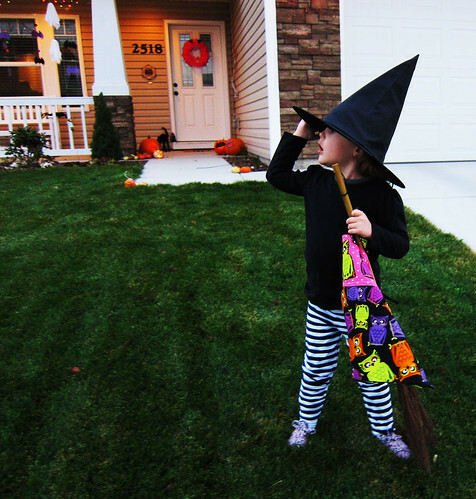 She didn’t want to be a ‘fancy witch, she wants to be a mean witch’. I was so bummed and kept asking and she always answered the same way. 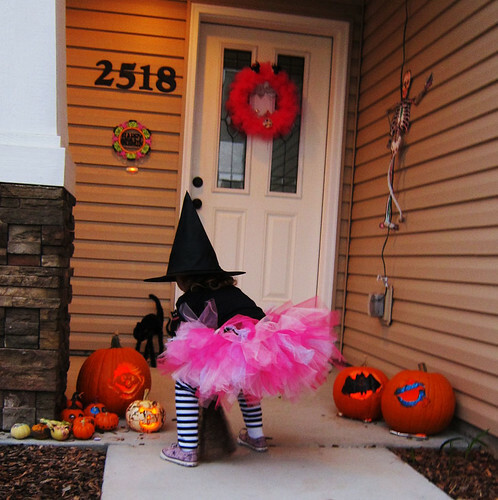 In fact a few weeks before Halloween she started to refuse the tutu. 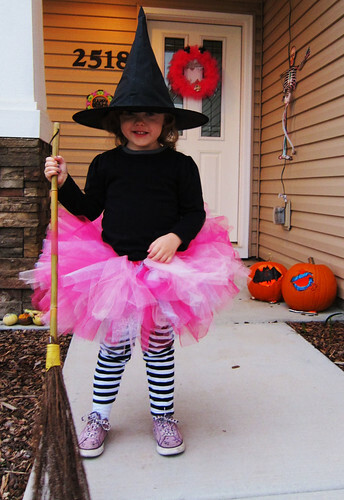 When I went crying to Waldo about this he said that he would prefer if the tutu was more halloween or witch colored, but I didn’t want to spend the money to make another tutu that she might not wear so I just kept hoping to wear her down. I didn’t go well. 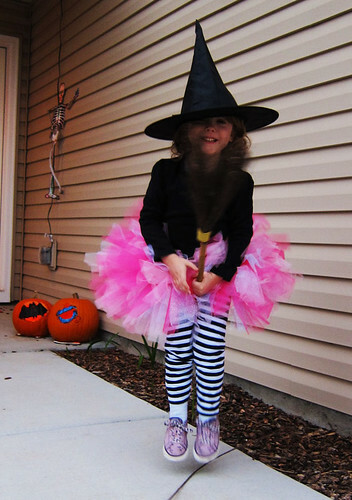 When we went upstairs to get dressed to trick or treat I grabbed the tutu and she refused to put it on. I begged her to just put it on so I take some pictures and tried to explain that if she didn’t wear it she would just look like a kid wearing a black shirt and stripped tights. She agreed for pictures, but wasn’t happy about it. I love this next picture. 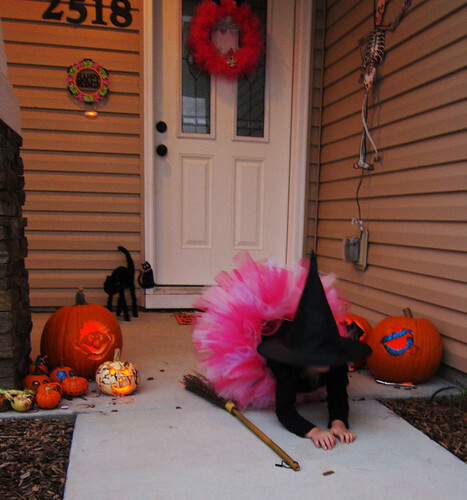 When the first trick or treater came around the corner Lily had a melt down over the tutu. While I was in the house helping her to remove the offending garment Waldo was talking to the Mom of the treater and found out that she was a black cat and was suppose to be wearing a pink feather boa but had the same meltdown about it. I felt a little better after that. This is how Lil ended up treating. Oh, oh, oh, I almost forgot. I made the bag she’s holding. I’m so proud of myself. 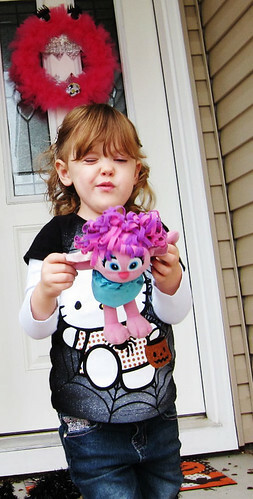 With this new chattiness Lily has decided is a good thing for her, she had a lot more fun going door to door this year. 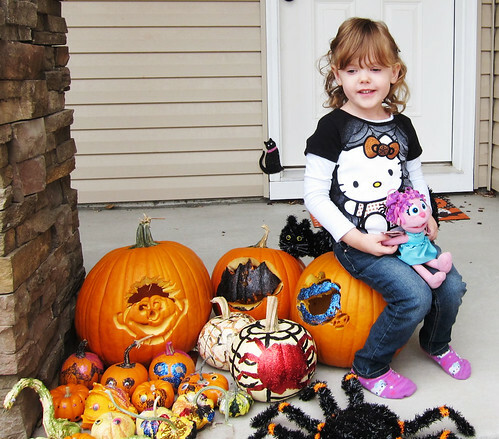 She said trick or treat to every person and was very excited about her candy haul. 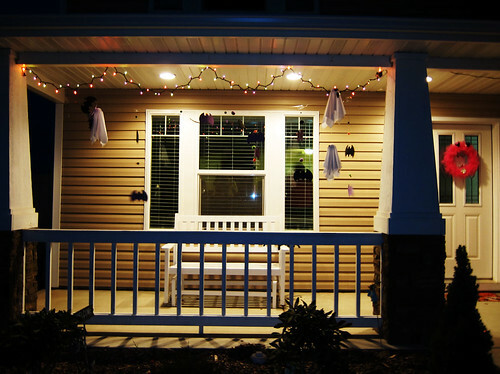 I was really happy with how our porch looked all at night and with how everything went over all. 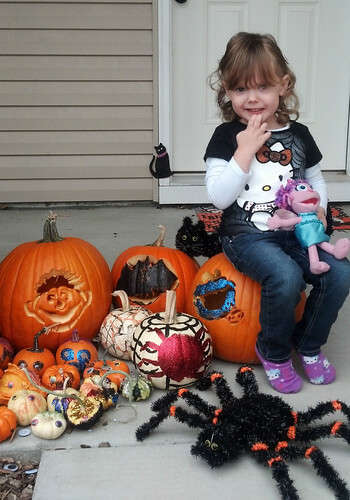 I’d say this was a very successful Halloween and Lil is already telling me what she wants to be for next year. 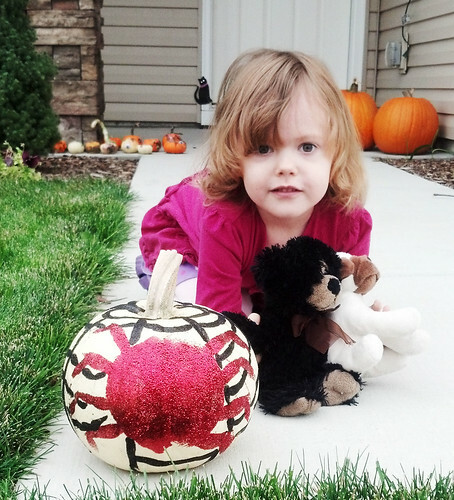 This entry was posted in Holidays, Life, Lily, Phone pictures, Pinterest ideas and tagged Holidays, Lil.